We post information on upcoming tax sales on our web site, and we maintain lists of properties held in trust. Check this page for updates in properties offered. Q: How do I buy tax lien certificates in Texas? A: Texas does not have tax lien certificates. 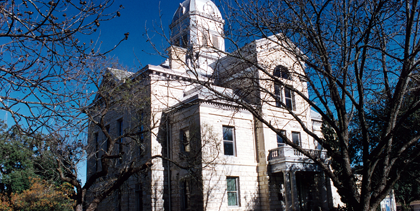 The Sheriff sells all property at the designated location in the County Courthouse. Q: Do I get a clear title? A: The purchaser gets good and perfect title to the interests of the persons named in the court’s judgment. Professional title abstractors conduct title searches prior to the filing the tax suit. Everything possible is done to deliver clear title. But we cannot give a warranty of title. Bidders must satisfy themselves as to the state of the title and the condition of the property. Q: Do I need to bring a cashier’s check or money order to the auction? A: Most Counties accept personal checks or cash. Q: When are the sales? A: The first Tuesday of every month between the hours of 10:00 AM and 4:00 PM at the Courthouse steps or at a location that the County designates for sales. Q: If my property is being sold, can I have it “pulled from sale” by making a payment agreement? A: You must see the Tax Collector. We do not get involved in payment agreements. Q: What is the sale price? A: All delinquent taxes plus court costs and fees of sale, or the value of the property in the court’s judgment, whichever is less. Q: Can you take less for the property? A: No. The amount is set by state law. Q: Can the former owner buy the property back? A: Yes. For residence homesteads and ag-use land the former owner has two years from the date the purchaser’s deed is recorded. The redemption price is the bid plus 25% for year one, 50% for year two. The bid includes any new taxes that the purchaser pays during the redemption period plus 25% or 50% of that amount. It is six months for other types of property. Q: If improve the property, are the costs of improvements included in the redemption? A: No. Reasonable repairs, yes. Improvements, no. You improve the property at your own risk during the redemption period. Q: How long should I wait to improve the property? A: At least one year for non-homestead/non-ag property because there is a one year statute of limitation for anyone to bring a suit against the title to the property.